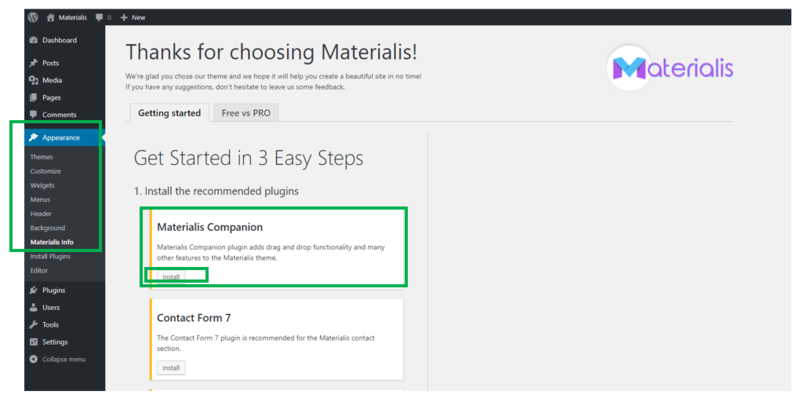 After completing the theme installation, you need to also install the plugin paired with the theme: Materialis Companion. Why is it necessary to install Materialis Companion? Because the plugin adds extra functionalities to the theme and features you can benefit from. It supplements the theme with lots of customization options. In the WordPress Admin dashboard, in the left-hand menu, go to the section “Appearance”, and enter the subsection “Materialis Info”. In the corresponding section, there’s a list of recommended plugins, that work right off the bat in the newly installed theme. On top of these recommended plugins, you will find Materialis Companion, as outlined in the above screenshot. Click on the “Install” button at the end of the Materialis Companion presentation. Wait until the installation is complete, and you will receive a message afterwards, confirming the installation success. Press “Activate Plugin” under this confirmation message. You can check that the plugin was successfully activated, in the section that is displayed upon activation.